If you want a coffee maker that can brew a single cup of coffee or a full carafe in under two minutes, you should check out everything that the Keurig K525 review has to offer. The reservoirs on Keurig machines have been getting bigger and bigger, and this brewer is no exception, with the first 80-ounce water reservoir on a Keurig brewer. This means that you can brew more coffee than ever, so if you have a group to serve, you won’t have to immediately brew up a second pot (unless they want more, which is likely going to be the case because the coffee in the Keurig K-Cup and K-Carafe pods is so delicious). This coffee maker has a lot of the features that you loved from the previous Keurig models, along with a few extras that we are sure you are going to love just as much. Some of our favorite features include the 2.8-inch color touch display, strength control, temperature control, and the programmable clock. There are also many accessories you can purchase separately to go with your Keurig brewer, including the Keurig Carafe. Who is the Keurig 2.0 K525 for? 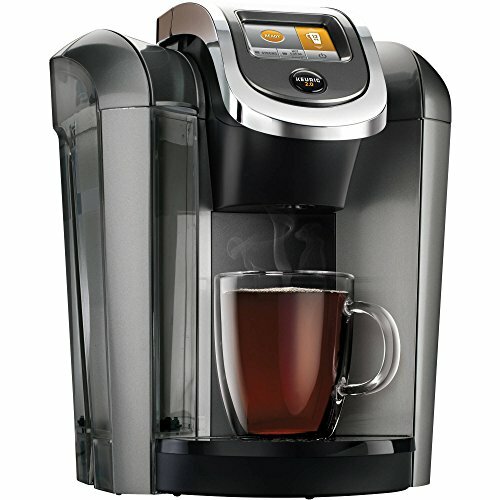 What's Included with Keurig 2.0 K525? Keurig coffee makers have been a delight for users since the original Keurig brewer came onto the market a few years ago. Of course people like these machines. They can easily brew a single cup of coffee without having to brew a full pot. But, some people do like to have the option to brew a full pot, so Keurig developed the technology that allows users to fill up carafes as well as cups. This newer model in the Keurig 2.0 series, the K525, has the largest water reservoir to date, so you can brew a full carafe, or up to eight cups of coffee without having to refill the reservoir. The Keurig 2.0 K525 is likely one of the best brewers in the 2.0 series, because it has so many easy-to-use functions. You can customize your coffee so you have the exact size and strength that you want, and there are loads of other fun programming functions to play around with. The Keurig 2.0 brewing technology lets you easily brew K-Cups, K-Mugs, and K-Carafes, and in just a minute or two. We just can’t say enough about the extra-large, 80-ounce water reservoir. You can brew several cups of delicious coffee before you need to refill it. There are a few differences that set this brewer apart from other Keurig models. Did we mention the 80-ounce water reservoir? This is new, and something that users have been waiting for. There are many different settings, but they are all easy to use, and the touch screen lights up so it is easy to see, even if you are making a cup of coffee in the middle of the night and don’t want to turn on any lights. The screen is also larger than it has been on other Keurig brewers. Do you like to have a delicious cup of coffee right when you want it, and not have to wait for a coffee percolator to do the job? If so, then the Keurig 2.0 525 may be exactly the brewer you need. You can brew yourself a single cup of coffee, and have it ready in less than two minutes. The manufacturer claims that you can brew a cup of coffee in less than a minute, but we do find that it takes a bit longer than this. Even so, less than two minutes is pretty good, considering how long it takes for other coffee makers to brew. Plus, most coffee makers don’t give you the option to be able to brew a single cup. Basically, anyone who loves coffee is likely going to be crazy about the new Keurig 2.0 K525 brewer. It is a heavy machine, but it is small enough to fit onto most countertops, making it ideal for offices, dorm rooms, small kitchens, and other small spaces. This brewer is in the same price range as its predecessor, and you can get one for yourself for around $150. It will cost an additional $15-$20 if you want to get the thermal carafe. What's Included with the Keurig 2.0 K525? If you want to get the best deal, look for a bundle package that includes a few accessories and some coffee pods. Some offers include a six-pack of K-Cup pods in a variety of flavors (you can’t choose your own flavors), a water filter handle, and two filters. It also comes with the instruction manual, as well as the water reservoir and removable drip tray. As with all Keurig products, you will enjoy a one-year guarantee against any manufacturer defects. You can check out this unboxing video on YouTube to see the machine right out of the box, as well as how to assemble it. There are several accessories that you can buy separately for this and other Keurig coffee makers. If you need a place to store your coffee pods, you have the option to get the handy Keurig Storage Drawer, or the Keurig Carousel. Of course, you still have your choice of more than 125 different beverage flavors, including coffee, tea, latte, and more. If you like preparing your own coffee grinds, you will love using the Keurig My-Cup reusable coffee filter. A thermal carafe is also available, which you will need if you want to brew full pots of delicious, hot coffee. Now we come to our favorite part of the review, talking about all of the great features that this coffee brewer has to offer. This machine is different from other coffee makers, because it can brew various mug sizes, as well as carafes, both quickly and easily. You can brew a pot of coffee almost as quickly as you can a single cup (under two minutes). Not only does the reservoir hold more water than the reservoirs in previous Keurig models, the reservoir lights up. So, you get a reservoir that holds up to 80 ounces of water, and you can choose from a variety of colors for the lights. This is a great feature because it lets you see what you are doing at night if you want to make a cup of coffee without having to turn on any lights. Some people like their coffee very strong. Others prefer it weaker. With the strength control setting on this brewer, you can brew coffee to suit anyone’s tastes. You can use any K-Cup pod size, and still get exactly the strength that you want, even if you like it strong. The easy to use touch screen panel makes getting your preferred strength simple, and you will be able to make the perfect cup every time. Another setting we like is the temperature control. This lets you choose how hot your beverage is going to be. There are five different temperature settings, so you should be able to brew the perfect cup for anyone. There is also a hot water on demand setting, so you can get hot water for other hot beverages. Simply select the brew size you want without inserting a K-Cup pod, and you will get that amount of hot water. This brewer features an extra-large color touch screen with a digital clock. The screen lights up as well, so it is easy to read in a dark room. All of the settings you will use can be programmed right on the touch screen, and you can brew a cup or carafe of coffee with the touch of a couple of buttons. You can choose the color for the lighted background of the touch screen. One of the best features about this brewer is the automatic on and off feature. You can program the Keurig 2.0 K525 so it will turn on when you want it to, and automatically shut off to save energy when not in use. 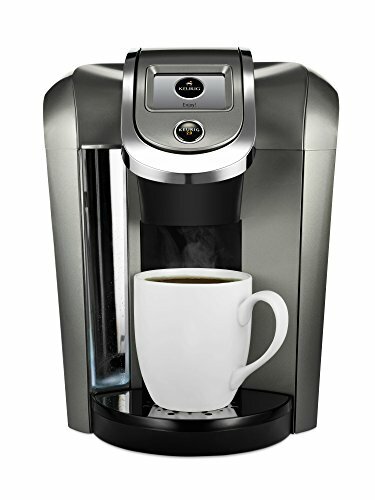 So, if you like to wake up to a fresh cup of coffee already made for you, this is definitely a Keurig model that you should put on your wish list, if it already isn’t. You can select from a wide variety of cup and carafe sizes. There are regular cup sizes ranging from four to 12 ounces, as well as K-Mug pod brew sizes that range from 12 to 18 ounces. There are also the K-Carafe pod brew sizes, 22, 26, and 30 ounces. You can brew any of the Keurig coffees, teas, cocoas, and other specialty beverages from more than 75 of the most popular coffee manufacturers in the world. We love that this brewer is so easy to look after. As long as you clean it regularly, which only takes a few minutes, you will always have fresh, delicious coffee. You need to make sure that you descale the brewer every few weeks, which is easy and can be done either with the Keurig descaling solution or a homemade solution of vinegar and water. The exterior parts can be cleaned with soapy water and a wash cloth. We do have a couple of issues with this coffee maker. For one thing, it is not easily available, and we know lots of people who would love to have one. Seriously though, there are a couple of flaws that we would like to talk about. First, the highest temperature setting may not be hot enough for some people. Some of us do like our coffee piping hot. Also, some users have reported that after a few months, the brewing process begins to slow down a little bit. One of the things that most users report about their Keurig coffee makers is that they are so easy to use. In fact, you don’t really even need to bother with the instructions. Simply turn it on, use the color touch screen, and brew your perfect cup of coffee. All the icons you need are right on the touch screen, where you can also program the automatic on and off feature. Depending on the seller you purchase the machine from, you may have everything you need to start brewing cups or carafes of delicious coffee as soon as you take it out of the box. If you want to know some cool tricks you can use while using your Keurig coffee maker, check out the hack in this YouTube video. As we earlier mentioned, not all offers come with accessories for the Keurig 2.0 K525. But, if you want to upgrade just a little bit, and it won’t cost much more, you can get the K550, which comes with a complete accessory kit that includes the My K-Cup reusable filter and a thermal K-Carafe. This is one of the only models that actually has the carafe included, so you don’t have to run out and buy one separately. There are still the same great features, and a few upgrades that make this another popular Keurig model. It costs a bit more than the K525, but the extra accessories make it more than worth the price. If you have been thinking about getting a Keurig coffee maker, it only makes sense to go with one of the latest models. The Keurig 2.0 K525 is among those models, and it has a few features that have not been available on earlier models. We love the automatic on and off feature, and the lighted water reservoir makes the ideal night light for your kitchen. Brew a cup or a full carafe any time, and in just a couple of minutes with the Keurig 2.0 K525.